Glenn, our lovely local Canson man gave another talk this year. Even though I was at last year’s there are several very good reasons for going to this one. Goodies! He brings nice things for us to use. Amongst other topics, the difference between a good and very good canvas was talked about. Look at the back is the suggestion. You need to see the unbleached colour of the linen if you are purchasing a very good linen. Also look for the wood stretchers the material is mounted on. Pine is not the best choice for longevity and gallery quality requires a different wood. As with many other things, price indicates the quality. You get what you pay for. If you want your work to last more than twenty years, you need to make sure the material you are painting on and with will last. For the most part linen will outlast canvas. Cotton based paper will outlast wood pulp paper. Good quality paints with more pigment and less filler will last better and you will get more from a tube. All of these will behave so much better than cheaper alternative as you use them. Also keep in mind light fastness. Poor materials will fade faster, this is aside from storage, display and archiving issues. We had some hands on experimenting with some paints and markers. I tried out the Schmincke acrylic and have to say it is lovely. I was told it stays usable for 45 minutes rather than the ten to fifteen I get from some others. It also felt like it didn’t need a spreader or any other medium to get tones and graduations. I am tempted to get a few tubes and give it a try in the near future. The colour in the Schmincke water colours was also stunning. Very intense and the colour lasted longer as you spread the paint out with water. I have some old Winsor & Newton paints and these would give them a good run as far as quality is concerned. A shorter presentation than last year, but still very informative. Glenn is also a fun guy to listen to … and yes I did walk away with some nice goodies to “play” with and experiment with! Ray is a registered teacher and has many years experience in the education system. He has been published in local newspapers for over twenty years and has lived in the Berwick area for over forty years. He worked as an art teacher for one year and was then promoted to principal. He was also conscripted into the army for two years in 1967. He is currently president of the Berwick RSL. Ray’s influences are Vane Lindsay, Don Martin, Leunig, Scott Adams, Glenn Baxter ad Gary Larsen. Ray has had one solo exhibition where he sold a few works, enough to cover costs. His work is based in cartooning and not “fine” art which he admits he had a go at but it didn’t stick. For the demonstration this evening Ray showed us a variety of prepared and previous cartoons from his library of published works. He also went through the files that showed us how he builds up images from a selection of heads with various expressions and body parts. He uses these when teaching kids as well, as these allow children who have problems writing to start composing stories and characters. His experience of learning to draw character when sick as a child has shown Ray that children who are having trouble with English for example, can benefit from the creative outlet of drawing and building characters from their imaginations. Ray had an easel with paper on it to show us how he can quickly draw up a simple character with both hands if necessary. The simplicity of the lines means that they have to be very expressive to convey the message. This is especially true with humour. The themed drawing were of interest showing us for example, the uses for a green wheelie bin and uses for a broken ski. Considering Ray is using such old and limited software he is producing some very nice and funny cartoons. I couldn’t’ help wondering, however, how much better they could be and easier to produce if he upgraded! He likes to keep the lines simple and not tidied up too much, giving them a look of immediacy, but I can think of a couple of programs that would help him and still keep that flavour to his lines. Now retired and producing cartoons mostly for the enjoyment, Ray produces work for the Berwick local paper and devotes his time to the local RSL. He gave an interesting chat about his passion and devotion to helping kids to learn. Attendees enjoyed listening to his stories and he gave them a good demonstration of his skills. I want to begin with the fact that I rarely if ever cry at art exhibitions – the last and only other time to my best recollection was at an exhibit that caused shock and sadness rather than tears of joy or any positive emotions. This time it was from overwhelming beauty. The colours, the story, the texture of the paint, the life of the artist, the atmosphere he created and the dedication to his art all came together for an experience that ended up being so much more than I had expected. I cried several times and may make a return trip to this exhibition in risk of doing so again. This was not just an exhibition for me, or a learning experience, it was one of those moments in your life where life changing and enriching seeds are planted – where you rededicate yourself to your calling in honour of those amazing artists who have gone before and those that are yet to come. “ The richness I achieve comes from Nature, the source of my inspiration. Claude Monet. Colour is my day-long obsession, joy and torment. To such an extent indeed that one day, finding myself at the deathbed of a woman who had been and still was very dear to me, I caught myself in the act of focusing on her temples and automatically analyzing the succession of appropriately graded colours which death was imposing on her motionless face. Claude Monet. Claude Monet also known as Oscar-Claude Monet or Claude Oscar Monet (November 14, 1840 December 5, 1926) was a French impressionist painter, to many he is a leader of the Impressionist movement in France. During a time of wars and social change through the industrial revolution, there was Monet. Struggling at the beginning of his career, but later on gaining enough patronage and sales to be able to purchase the house that he had finally settled into with his now sizeable family of his own children plus ones of the women who became his second wife. As I moved around the gallery from one work to another the things that struck me the most were the colours and textures of the paint. Cool colours blended and balanced with warmer ones, muted and sometimes bold and striking, with the paint laid on in thick lashings in places to bring the points of interest right off the surface of the canvas. As I moved closer the colours laid over the top and around each other were visible, stepping back across the room, they blended and merged together retreating into the background to allow focal points to stand out. The water lilies were not just one layer of paint but layer over layer of warm greens, cool mauves and blues, pinks and creamy yellows. The water was also made up of layers of colour that looked like they were glazed over each other to get a richness and depth to indicate reflections from the sky and surroundings. Varying brushstrokes and thickness of the paint also gave form and direction as well as texture and interest to the paintings. “My garden is my most beautiful masterpiece.” Claude Monet. Paintings in the exhibition varied from smaller rounded canvasses to very large panels, many were not painted edge to edge and the canvas can still be seen inside the framed area. It didn’t seem to bother me as I was so entranced by the paintings themselves. I particularly liked the “Waterlillies Nymphéas” painted on the square panel. The flowers were so striking and the layering of the colours gave it a luminescence that captured my attention. Another was “Roses – Les Roses”. Painted after Monet had his operation to fix failing eyesight due to cataracts. There is almost a joy in this painting as the marks skip across the surface creating the foliage and limbs of the meandering rose bush and the scattering of the colours to indicate the flowers. Even the sky seems to flow around the roses as if playing with them in some sort of game. Monet’s stronger coloured paintings produced from around 1922-24 show his struggle with his eyesight. At first I didn’t take to them as I had the other works, but as I moved away from them and had another look across the room, the depth and perspective were very clear and I gained a new appreciation for them. I can understand how Monet was very happy to again be able to see his lovely blues better after his operation. From one room to another his love of certain colours for me seemed very clear. I loved his very large panel of the wisteria with its gorgeous mauve and blue colours with the tiny dashes of crimson red. It came as no real surprise that during WW1 Monet donated paintings to help war victims and that even though two of his sons enlisted, he was horrified by war. His weeping willows are in homage to the common soldier, who suffered in this brutal conflict. I love that Monet didn’t see the need to paint the horror of what went on around him, he could paint to inspire rather than to confront. The paintings from his travels show his dedication to his art. Even when faced with personal tragedy, he only stalled once that I know of in his pursuit of painting. From the Rouen Cathedral, to the city of London, the colours are vibrant and enthusiastically applied. The river Seine and even the few portraits he did of his sons have beautiful use of colour. I am so happy that Monet’s garden and home have been restored for us to visit today if we get the opportunity. I know that in the peace of my own garden space, there is a quietness that comes over you, a retreat from the noise and rush of the everyday. There is something in the handling of the soil, the connection with the plants and interacting with the birds and other creatures of the garden. Your artistic mind gets to create the form and the range of colours in your garden, the textures and the way the light will play its way through it. For me it is another way of exercising my creative brain and giving it a kind of rest at the same time. The clutter and noise of the rest of the world fades away and leaves you with just the garden and you in it. I hope that is what Monet found in his garden. I would love the opportunity to travel to be in this space and experience the atmosphere for myself one day, and maybe, if I am lucky, find some of the inspiration that Monet found in it. For me this trip was more than seeing a collection of paintings. Some see just that, a pile of lovely paintings. I see a man’s life, his loves, his losses and his work. He looked for material in travels and in his garden. He kept experimenting and evolving his methods, style and subjects. The luscious paint in the garden scenes seem to pop off the wall inviting me to walk my eyes in to each and every work. OMG I am in love. These notes are from my most recent all day workshop with David Chen. Each full day covers over five hours of theory and practical work, and are planned by David to help us to understand an important aspect of planning, composing and creating our paintings so that they not only look beautiful but also look “right” as far as tonal contrast, perspective, composition, colour mixing and application of our paint. For this session I showed David a still life that I have recently finished and the photos I took to use as references for not only this works but future ones if I wish to do another in a series. I talked to David about my decision making process as I composed the work and he agreed with much of my final choices which is very encouraging! He suggested that I use one of my reference photos for today’s workshop, which I did. Still life has not been my best subject in the past and I have received my worst critique from a couple of artists/art teachers (unsolicited in one case) on what I thought was one of my best attempts. So understandably I broach this subject with some nerves and am trying to work my way past it. Working with only three colours can be liberating at the same time as it is restrictive. You have to broaden your thinking to tonal values and nearly ignore that actual colours unless they fall closely to the temperature of the one in your reference. One example is the burnt sienna I used instead of red, a warm for a warm with similar tonal values. It looked a bit weird but I ended up making a better painting in the muted tones where I had to do a lot of substituting and work purely on tonal values than I did on the brighter high key painting that was done first thing in the day. I am not sure if it because it took a while for me to get my eye in, or if I have a natural gift more in one way than the other. I has given me a bit of a project to work on at TAFE this week for painting. I have a piece that I have blocked in and David said it was a good example to try this method out on again, this time using Ultramarine Blue, Permanent Crimson and Cadmium Yellow for the Triadic Colours. This will be high key rather than muted so a chance for me to have another go and do a better job. A triadic colour scheme uses colours that are evenly spaced around the colour wheel. Triadic colour harmonies tend to be quite vibrant, even if you use pale or unsaturated versions of your hues. To use a triadic harmony successfully, the colours should be carefully balanced – let one colour dominate and use the two others for accent. For example one would be a light colour and the other two darks or the other way around, two darks and one lighter. Keep in mind that you can also use white with these to gain the advantage of tonal values. For further descriptions of colour systems I have found a very good web site that I used when researching further after yesterday’s workshop. If you are struggling with colour systems it has great diagrams and simple explanations. The web address is: http://www.tigercolor.com. Keep in mind that you also have all the tonal ranges of these colours to use by the addition of white, so you are not as restricted as you may think at first. In one way, taking away the confusion of colours (as so many are out there) leaves you free to be more creative with your painting. If you keep in mind your tonal values as the colours are not of any importance. This is a great exercise to show up your colour bias when painting. I now had a good idea that I was biased towards cool colours. This just means that more practice painting in the warm side of the colour wheel will make me better as a tonal artist no matter what the colour I am using. I will be free then to use any colour I like for any subject and get an excellent and believable result. Try painting a scene with only 3 colours from the colour wheel using the above diagram as your example, plus white. The colour straight out of the tube will be your darkest tone, and you can lighten it using the white to get as many values as you like. You can also mix two of these colours with each other, then start adding white which gets you even more colours and tones. Choose any subject and paint it with these colours. It doesn’t have to be photo realistic, in fact use the photo as a guide only, not as the rule to stick to. It may be a good idea to discard the photo after you have the basic idea and paint creatively and not as a slave to your reference. During these exercises composition is not the aim, I was totally unconcerned with creating a finished painting but learning the lesson of using the colours. Below are the 2 works I did at the workshop. They could always be improved but I was not aiming at completing a finished artwork, but at practice pieces. They reflect process and not completion and as such I am happy. You may note that I have a wider tonal range in my muted painting than the high key. This of course may also be attributed to the fact that this was the second work of the day and I was more awake! It was also my second stab at the same subject so I had worked out a few of the kinks from the first. David looked at all our works at the end of the day and showed us where our paintings could be improved. Apart from a couple of little marks and showing me that my background needed to be a little more varied in the high key version, he left my work alone and showed it to the class (especially the muted work) to show how the paint and tone could be manipulated. He did say my weakness for the high key colours needs some practice but was sure I can master it! I was more than pleased that he thought I had done well on the day. I was happy that I was able to paint the second work mostly from memory rather than continually going back to the photo for reference. My goal was a painting, not a copy of my photograph. That was more evident by the orange in the paintings not being in the photo at all. David suggested that I try putting one in, so I had a go at it! I knew where the light source was, and I know what an orange looks like, so why not! David said he liked my second painting more than the first and asked me why he did. I didn’t answer him well at the time but looking at them both side by side now, the tonal range in the second is much better, the light and shadow falling across the surface and around the orange is better, the light coming in from the left is better and the modelling on the orange is better, there is also more range in the background and the brushstrokes are more interesting. This happened when I stopped looking at my reference and painted what I knew rather than what I was looking at. I have promised that I will spend some time during the next week practising my high key triadic colours at TAFE, so on painting days get ready for at least one painting based on this method! Thank you David for yet another fantastic workshop! Sonia Payes is one of Australia’s leading portrait and thematic photographers. She gained attention with her early portraits both captured and defined her subjects, culminating in her photographic essay of 60 significant australian artists in their studios which was published in UNTITLED: Portraits of Australian Artists by McMillan Publishing in 2007. More recently Sonia’s work has veered towards the surreal with haunting portraits and landscapes that captivate the viewer with things that are obscured and left unseen. Her Iceman Series in in the gallery at present. Sonia studied Arts and Photography at Melbourne Art School in 1987, Arts and Communication at the Australian College of Photography in 1991 and became master Photographer at the Australian Institute of Professional Photography in 2001, she was also granted the Australia China Art Foundation Residency in Beijing in 2012. Sonia has a current exhibition in Melbourne and is an engaging speaker. She has a wealth of experience behind her and her skill with the camera comes through win her prints. Today she presented a Keynote presentation of her works spanning her career. She has a great interest in the human figure as it fits into the landscape and the contradictions of the natural world and the impact that human development has on it. Many of the photographs have the face of her daughter, who she has used in both her composite images and 3D modelling works. Sonia has done very well in China, even given their way of working which means that once they have made up their minds to go ahead with a project – it all happens very quickly and you need to be prepared and ready to work hard. Everywhere that Sonia goes she is taking photographs. She has a huge library of reference pics going back to her youth, she is willing to pull out anything from any stage of her life and use it with current images to get the look she is after. An interesting point her is that she does not use Photoshop but only the camera for her effects. How this is done with images that are in her library on the computer I am not sure. Making up your image with just the camera however, show how much understanding she has of how it can be manipulated and pushed these days for creative output. Many of Sonia’s more recent series’ are aimed at the use and misuse of the land by human industry. She spoke about the changes in China in particular, and how the land is being having all its nutrients taken out by over-farming and then built over. This is a problem in a lot of countries, as the demand for fast food production gets higher. We can see the land being built over in our own state, where good fertile soil is being covered up by housing estates and industrial parks. The textures, the atmosphere and the human impact are all intermingled in sonia’s photographs to tell stories about the state of humanity. She is not a crusader, just showing her views of things. In her latest series, not yet published, she intends to show the results of our direction. Humans morphed and evolved to cope with living in a more hostile environment of our own creation. Again these will not be confrontational, but rather, thought provoking. Many photos are representational, and the overlays of 3D shapes with lighting effects and textures to guide the viewer into making up a narrative for themselves. Her interest in 3D printing for future creativity is something that I have thought would be great to investigate, as probably other artists have as well. It will be interesting to see where it goes as these printers become more affordable. Another thing that was interesting is that work such as short animations, and other work completed via the printer or computer are done in co-ordination with artists working in China. There are a lot available to get this done very quickly and at a price she can afford rather than trying to do everything herself. Many of us push ourselves to try to do everything, and it is a good lesson to see that working in a group or in co-opertaion with other artists and associated industries for the arts is a good use of our time. I am not intending to be a professional photographer, but do use the camera in conjunction with my creative process for researching subjects, reference material etc so it was an interesting talk on several levels for me. As always you take away from these chats as much as you are willing to get out of them with a little imaginative thinking. Australia only has five works by Monet in permanent collections, of which two are in Victoria. With over sixty works in this current exhibition we are very lucky to see so many of Monet’s later works in the one place. The Musée Marmotten Monet has the largest collection of Monet’s paintings in the world. This collection traces the evolution of his garden over twenty years including work that inspired the abstract expressionists. Monet was considered to be the father and master of French Impressionism. His early years were not financially successful but later on he did well enough to be able to purchase his house, travel and employ gardeners for his expanding garden in Giverney. During the 1840s, the middle class in France grew and became influential. During this time, as the child of a fairly well off family, Monet began to draw. He was encouraged to pursue his art. With such mentors as Delacroix his skills soon became apparent. During the 1870’s new inventions such as the camera and paint in tubes made it possible to begin what we now familiarly call plein air painting. As the Impressionist movement took off, Monet’s natural leadership, clear vision and confidence made him come to the fore. He mingled with politicians and people of influence as well as other artists and was also a great influence on visiting Australian artists. He painted with the likes of John Peter Russell from Australia and his influence can be seen in his paintings of the time. He also painted with Frédéric Bazille. He became good friends with both these artists. He was also good friends with Pissaro and Renoir. Monet showed his love of water so much that he became known as the painter of water. He travelled to places such as London during the Franco-Prussian war to avoid being conscripted into the army, and produced some beautiful paintings of London city. This is where he was influenced by Turner and Constable, whose use of colour and light was something that he admired. He also met an art dealer named Paul Durand-Ruel who took him on as patron and dealer of his work. Moving back to Paris after the war, the river became a major topic. Sales improved and in Argenteuil he moved into a new home, and other Impressionist painters joined him. This was all leading to the first Impressionist exhibition where the name, originally meant to be an insult, was turned around and used as the official name for the movement. The good economy didn’t last however, and Monet was soon forced to moved again to a shared home. Soon after his wife died and he was now the sole father of two. This leads us to his move to Giverny in 1883. Monet moved there with new lover and her six children as well as his own two. In the small town a mixed family such as this was not socially accepted and the family had a solitary life. Monet travelled to paint in the winter, and in the warmer months painted and tended the garden. Monet painted series’ of paintings of the same subject. During this time he did his series about Rouen Cathedral and the well known Haystacks. These were very successful. He went to Norway and loved the snow and the way the light reacted to it. After seven years he was able to buy the house and his journey building his now famous garden began in earnest. Monet’s Garden was planted with the changing seasons in mind, he planted considering colour and time of year so that there was always something going on. He loved roses and planted a row of climbing roses over arches leading to the house. He went on to purchase the land across the road to develop ponds. These became his lily ponds where he painted a multitude of colours and went on to work not only from the shore but also from a small boat that he built. He even brought in a Japanese gardener to tend his Oriental planted garden and put in an oriental bridge, which can be seen in many of his paintings. At one stage he had several gardeners tending his garden, even taking the dust from passing trains off the waterlilies for him to see them better to paint. All these series of paintings were to help him to understand his subject better. We may like to think of Monet happily painting in his garden through an unworried lifetime, but he lived through two wars and the onset of cataracts. The loss of his sight, mostly in one eye more than the other can be seen in the change of style his later years. Monet developed depression and nearly lost the will to paint. He could not see detail and could not see colour properly. It is thanks to his second wife (the lover he was now married to) that he took a trip to Italy to regain some of his enthusiasm and drive to paint. But sad events came to him again with the loss of his wife, son and daughter in a short period of time. Finally Monet decided to have the surgery to save his vision. The paintings he had been working on became clearer to him. Some he kept and finished, some he destroyed as he was not pleased with them.The large panels he had begun were completed. Many of his works he now held on to as he was successful enough to not have to sell anything he painted. His painting of the roses in his garden after his surgery show his renewed clarity to see the beautiful blues of the sky and various colours in his beloved roses – and his delight in being not only able to see them again but also to paint them. At the age of 86 years, in 1926 Monet passed away. His home and garden, now a gallery were donated to the public by his son Michel. To cap off the life of this amazing artist I would like to quote what he said of himself. This was a terrific way to get ready for seeing the beautiful work of this brilliant artist. I can not wait to go to the exhibition! I may have to see it more than once, to get the full benefit of learning from a master and drink in all the amazing colours I am sure are waiting for us. I have bought the book, am excited to get into the read, but nothing will compare to seeing these wonderful paintings in font of me! To introduce Lorraine I am borrowing from her biography in her web site. I feel I can’t do better than she has to describe her introduction to painting. “Lorraine Lewitzka was born in South Australia in 1952, into a family of artists and worked as a fashion and illustrative artist in the late ’60’s, beginning watercolour painting with Marjorie Hann in 1985. In 1988, Lorraine was accepted as a Fellow of the Royal South Australian Society of Arts and began exhibiting in private and mixed exhibitions. A significant highlight and turning point of Lorraine’s career was the inaugural study award at the Victor Harbor Rotary Art Show. As a result, she was tutored by four distinguished watercolourists in the USA, being Robert Wade, Betty Lou Schlemm, Christopher Schink and Alex Powers, after which she attended a summer school at the Slade School of Art, London, discovering the new medium of oils in life painting. Adding to her traditional drawing and watercolour skills, was valuable time spent with Leonid Vasin, Professor of Fine Art from China. Over the years, Lorraine has always endeavoured to produce works of substance, giving the viewer opportunity to grow with and into the painting. At present she concentrates on figurative landscapes, portraiture and interiors in watercolour and mixed media with her intimate oil interiors finding much popularity also. 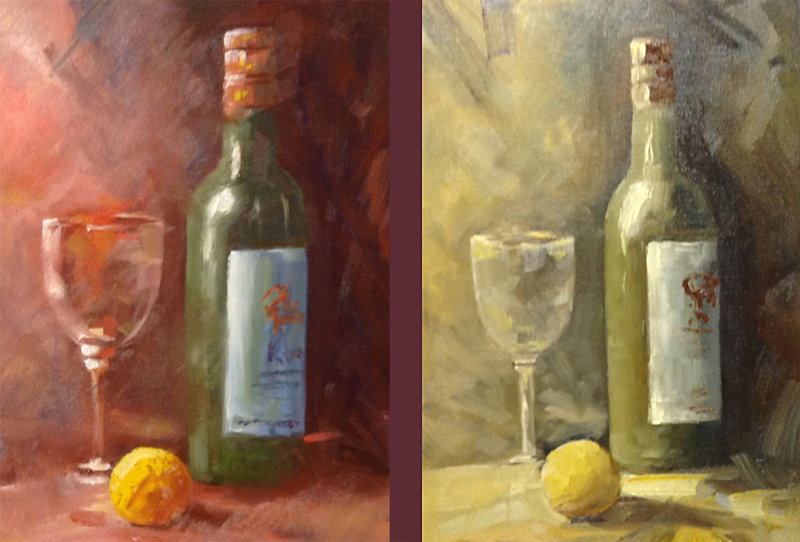 With good, underlying draughtmanship Lorraine enjoys capturing the moments and snapshots of everyday life, playing with the light or solitary moods in which the subject lives. Lorraine has continued to participate in many exhibitions and consistently wins prizes in both watercolour and oil competitions. Her articles have been published in Australian Artist Magazine. She has demonstrated at the prestigious Camberwell Art Show and worked as guest tutor on several occasions for the Australian Guild of Realist Artists (also a member), and invited as judge for their final 2006 exhibition. Having tutored regularly in South Australia, Lorraine has also been called to teach in Queensland, NSW, Vic, Tasmania and WA. As you can see Lorraine has a very sound grounding in her chosen career. As we were waiting for her to set up I had an opportunity to have a look at the paintings she had with her for members of the society to purchase on the night. Her colours are clean and crisp and the line work is subtle and very appealing. Her paintings have loads of atmosphere and there is no doubt about her excellent drawing skills. It was not surprising that several were snapped up on the night. Lorraine had arranged to demonstrate two mixed media pieces, using water colours and pastel. The subjects were different as well as the papers. One was water colour paper which was painted over with a water colour wash, the other was pastel paper which was what looked like a mid tone of grey allowing immediate blocking in of the shadows and darks with water colours and pastel over the top. The love of figurative work comes out in a lot of the paintings that Lorraine brought along with her. Her skill at rendering figures also became obvious as she very quickly drew in her layouts. After the initial lines were in she put in her darks with the water colours. The addition of white gouache in the window areas showed up her painted areas and as the pastels were drawn in the whole thing just came to life in front of us. Lorraine also used charcoal pencil and said that she likes to keep lines in her work and not to give them too much of a finished appearance, but keep the more loose and painterly effect. In effect using the principle of less is more, allowing the viewer places to rest the eye and fill in information for themselves. A very light yellow was drawn in over the white in the window and reds and blues for the figure with soft highlights helping to model the shape. Various colours went on to the bench top without too much detail in effect creating an interesting pattern more than a copy of items that may have been in the photo. Little marks went in to show the curve on the tops of jars and scurried marks for highlights elsewhere. Before the break for coffee the artwork was completed. This left the time afterwards for a quick study over the now dry watercolour wash. The males figure and camel was from a photo taken in Morocco. Drawn in lightly with a charcoal pencil with lots of little straight lines the figures were built up gradually. This is a great method of drawing anything as you can keep on slightly adjusting until you have everything the way you want it. The focal point was decided on and water colour was again used to quickly block in areas of shadow. A few splashes of paint were popped into the background and a large part of the top right hand side darkened with the paint as well with some allowed to run and drip down the page. The figure, which was in traditional clothing had a striped pattern which now really stood out. A light source was decided on as it was not clear in the photo and the business of laying in the pastel was very quickly done as we only had about half an hour. Some of the background wash was wiped back with a damp sponge and gouache was again used for light areas on the man. Some darks were laid in to balance out the dark area introduced to the top right hand side and the camel received some textured marks with mid and darker toned pastel. The majority of the detail was left for the main feature which was the man in his traditional clothing. With regular checks in the mirror Lorraine was able to put together this second work with amazing speed. The little finishing touches of the red in the hat and warm skin tones made the work look stunning. Two amazing works done in one session and one was donated to the Society for the raffle on the night. A very generous gift which we were very grateful for – especially the lucky winner! My special thanks to Lorraine for such an informative, creative and interesting demonstration. “Fiona Bilbrough was born in 1967. She studied at the University of Melbourne and graduated with a Bachelor of Education in Fine Art in 1989. Fiona took a two year course with John Balmain in portrait and still life painting in 1988 and 1989. She received regular feedback from him until his death in January 2000. Fiona was an art teacher for multi-aged groups in oil painting at the McClelland Guild of Artists 1986-1995. From 1988 onwards Fiona was a contract Art teacher and Artist in Residence in a number of schools. From 1990 to the present Fiona gives private tuition for children and adults in her own studio. Fiona teaches still life, portraiture, plaster casts and in open air painting utilising the Meldrum methods of casual observation. A special achievement is receiving the Alice Bale Scholarship in 1995. This enabled Fiona to study master paintings in Europe. Fiona has a wonderful touch with the brush and even with all her accomplishments, is still learning and adapting her style. For both Still life and portraits, she likes to set up her own lighting and prefers to work from life rather than photos. With this amount of control over the setting she is able to get some dramatic effects. Fiona achieved in the time of the demo another thing that quite a few other demonstrating artists have not and that is getting two works mostly done, whilst passing on a heap of valuable information. Both works were done on board with linen on it, the type of linen a little different for each one. Fiona’s goal for the session was to give us as much good information to help us improve our painting skills as she could, rather than just showing us how she completes a painting. This is such a good idea, as many walk away from a demo thinking “oh that looked easy”, then give it a try to find out to their dismay, that they don’t have all the necessary facts to be able to do it, or indeed the hours of practice in front of the easel. There are several things that Fiona does to make sure she is efficient when getting to work. She marks the floor with a ruler so she never has to look down from her viewing point to check she is in the right place. She has a regular way of setting out her paints so she always knows where a colour is. She has all her tools at hand such as a tub of dry brushes and a tub for the used ones, or she may lay the brush down on the palette near its colour. Her medium is mixed and ready, even though it looked like she uses very little, relying on the good quality Winsor & Newton and Daniel Smith paints to have enough in the tube to not require much. If she does use a medium to thin out paint it is a mix of Linseed Oil and White Spirit. Even though the paintings were fairly small, the blocking in was done with a large brush. Getting the surface covered and covering the white makes it easier to get on with the painting. Painting dark to light is also easier this way. the dark background is loosely painted in and the paint kept thin. With the use of rag (old nappies or flannel) the items for the painting are wiped back out of the paint. By stepping back and checking a lot, Fiona was able to quickly get the shapes of the painting in and begin painting in the colours as soft stains to begin with which were built up with simple strokes of the brush making sure that the colours were kept clean. As she painted Fiona said that if you are not sure of what you are looking at because of lighting or it being out of focus, lose the edges and keep the sharp edges for your focal point. This is where your harder edges, your bigger contrasts and thicker paint should go. Fiona also said that we should buy the best quality brushes and canvasses that we can afford. It helps to paint better if your tools are not letting you down. The surface you paint on can differ a lot as well and some take the paint so well it makes painting on them a real delight! Practice was another big point from her session. If you want to excel at anything you practice, the more you do that the more you are comfortable with your subjects and materials. No one who wants to be considered a professional or at the top of their field would consider not learning as much as possible or practicing a lot. The whole life of being an artist to be honest is a lifelong calling to keep learning. There is always something new, some aspect of painting or drawing that you can improve, modify or adapt. There is also the need to understand the medium you are using, we need to know what it will do given the circumstances. Not that we know it all, especially with water colours as they can sometimes give us happy accidents, but the more you practice, the better the chances of being able to mix the right colour first go and knowing how your paint will react on the canvas. If you are tired or hungry when painting – take a break. You can’t concentrate 100% if your body is making demands of you. Similarly, if your time is being taken up with tasks that you can delegate out and you really feel you don’t need to do them personally, do it. If making up canvasses, framing etc is taking you away from painting and that time is more profitable, pass that on toe someone you trust to do it for you. this is done in business all the time and an arts practice is no different in this regard. Surrounding yourself with like-minded people who will challenge you as an artist is also a great idea. Join a society, go to workshops, go to exhibition openings and learn to network. The artists we are lucky enough to have in this country are amazing and many are very generous with their time and information. There is a great support network out there if you want to tap into it. As Fiona was painting in the shadows and highlights to the fruit, she reminded us of the way that light works. There is the area where the highlight is and the area with the darkest shadow. These are never on the edge of the shape but in a little. As the ball or rounded fruit such as a grape or apple sits on a surface with a light on it, there will be reflected light coming back up at it from underneath. There will also be an area of mid tone as you go towards the edge near the highlight. These changes in tone are what makes the object look round. By the break Fiona had produced a really lovely painting, not completed to her very polished standard but there was a lot of information, questions and talking done. For the next painting she used an oval shape to paint on to. this suited the subject of a silver urn, wine glass and fruit really well. The background was painted in the same as before, and the subjects wiped back with a rag. The centre point of the board was marked with the rag and a couple of marks for proportions. Fiona used Windsor Green instead of Viridian for the fruit, as she is of the opinion that Viridian os not as transparent as it used to be before manufacturing went to China. The transparency helps to wipe back leaving the stain to begin the fruit rather than too much paint to go over. The glass in this painting was achieved with very little work, as the hint of light touching the edges and a little sheen was all that was required to indicate a glass you could see the background through. The silver was done using a mix of colour for a cool grey rather that black or Paynes Grey. The highlight achieved by very light touches from the edge of a flat brush rather than trying to get it done by drawing a line with a small one. The shadow side of the objects were kept soft and the focal point had thicker paint and stronger contrast. This painting was not completed either, but what I was so happy with from this demonstration was the amount of quality information I came away with. Some of the tips I am happy to say I have just discovered and am using to make my time in front of the canvas more productive, some were new and I can’t wait to try them. Some of the methods Fiona used looked similar to what I am now applying so I am happy about that also. I like the idea of getting into the studio and setting yourself a time limit, a limit of colours on the canvas etc. By giving yourself a clear idea of what you have to do with a deadline and no confusion about your materials, it somehow leaves you free to be totally clear-headed about the creativity and processes. There is also the logical point that if you want to be in business you can not spend all year painting only a few or less paintings (unless of course you can charge a year’s salary for it and sell). This was an especially good session. Fiona is so knowledgable and a very good speaker. I have seen her work before, showing us how to paint portraits and each time has been enjoyable and a good learning experience.